2019 is set to be a year which cleanses the crypto market of scammers, brings about more comprehensible regulation of crowdfunding campaigns, the advancement of DEXs and related technologies, and the expansion of companies applying decentralized technologies. Here are some forecasts for the crypto industry for the upcoming year which, of course, should be taken only as a set of opinions and not a direct guide to action. The year 2018 marked the great ICO hangover with a tenfold decrease in total funds raised through token sales in November compared to that of January. The fact that ICOs have become almost a red card when trying to attract media attention has been appreciated by projects in the blockchain arena. The most affected were those who had at the very least some kind of tested product behind them, in the ocean of those who only bothered to muster up a white paper. This does not mean, however, that this fundraising tool which has proven its viability in a number of successful projects like Ethereum, EOS, and NEO, should be discounted. The main trouble is that speculators, scammers, Ponzi scheme followers, and even hypothetically innocent projects affected by attacks, overheated the market and enraged regulators. No wonder the ICO ended up being consequently banned in China and Hong Kong or faced a clampdown by the SEC. In pursuit of something less associated with criminality and hacks, the industry has come to a safer alternative for companies aimed at raising funds – regulated security token offerings, or STOs, which are a trend set to take off in 2019. Although the share of projects running STOs is now relatively small, complying security tokens with US securities law is intended to restore credibility amongst investors. From an investor perspective, security tokens imply far greater flexibility – in particular, the ability to easily sell them – and trustless transactions without the need for brokers and middlemen. Does all this mean that STOs will run like clockwork? Probably not, and for several reasons. Firstly, launching an STO remains no less complicated, costly and scrupulous than an ICO due to the ton of paperwork required for registration. For garage startups, fundraising will still remain an unbearable burden. Secondly, running an STO does not mean setting previous requirements to zero, such as KYC and AML compliance: procedures which bring about a loss of anonymity and privacy. Thirdly, if your startup meets the SEC requirements today, this does not mean the same will be said for tomorrow since the commission’s intentions remain a minefield. All that is left to do is wait for the SEC and other regulators to submit clearer rules of play. One way or another, the beginning of 2019 is expected to be marked by extensive lists of STO projects, along with collected funds aspiring upwards. 2019 is set to become a year in which the rules of the game in the crypto market will become clearer if jurisdictions across the globe follow the example of United States’ SEC and Hong Kong’s SFC guidance. In addition to tougher sanctions towards ICOs, regulators will also focus on AML (anti-money laundering) and CFT (combating the financing of terrorism) regulations. Overregulation, however, may lead to crypto companies’ migration into more friendly jurisdictions and the setting up of new crypto hubs. “Governments overregulate at their own peril. As China and Singapore lost Binance to Malta, other companies will choose the governments that are the most open to cryptocurrencies, like Japan, Gibraltar, Switzerland, Malta, Cayman, some African countries, Singapore and others,” says Tim Draper, venture capital investor, founding partner of Draper Associates and DFJ. As for the US, they, according to Draper, might still be in the game if they come up with clear, light-touch regulations for crypto companies to operate within. In 2019, blockchain-powered startups are expected to focus on advancing the unstoppable infrastructure for the digital world, including decentralized computing, a vital part of which is the elimination of single point of failure. “Bitcoin and all its associated technologies will lead the world to the transformation of many of the largest industries. And when Bitcoin, the blockchain, and smart contracts are combined with big data, deep learning, and Artificial Intelligence, almost every industry will ultimately be improved. Finance, banking, commerce, insurance, real estate, the law, accounting, healthcare, and government are the obvious industries that will benefit greatly from a new technological shot in the arm,” Tim Draper claims. “The blockchain will gain momentum in finance, which will result in the creation of counterparts of traditional financial instruments, asset management tools and new forms of securities,” says David Shengart, co-founder at SWIDOM agency, focused on fundraising and providing services for blockchain-powered projects. According to Shengart, the need for a blockchain in this area is now well understood by crypto enthusiasts and bankers on Wall Street. Mainstream companies will be also implementing blockchain en masse. The reason for this is that many of them became cramped in their own shell and are now getting out of it and trying to fill new niches. Blockchain may well be what they need. According to Mr. Draper – who is confident that the price of bitcoin is still on track to hit a quarter of a million dollars by 2022 – the adoption of cryptocurrency by large network companies will have a positive effect on the bitcoin exchange rate. “The real knee in the curve will happen once all the great engineering work is complete and we can easily spend our bitcoin at Starbucks, Amazon, at the gas station, to buy a Tesla, real estate and so on. More bitcoin wallets, more usage of bitcoin and other tokens too, more creative solutions to using tokens in various marketplaces. Just more,” he says. The professional advancement of teams working at the intersection of IoT/AI and blockchain will open the door to transgressing industries and their transformation into industry 4.0, with autonomous machines able to fulfill obligations that are programmed into smart contracts. This will advance the nascent ecosystem of smart cities and industry 4.0. The area in which the blockchain stands a good chance to succeed in 2019 is making supply chains more transparent by opening data up in regards to what is happening inside a factory, product storage or delivery chain. “There will be more services in IoT which aim to analyze data and redistribute them into IoT-based services in smart cities, not only for improving infrastructure but also to the benefit of the consumer. 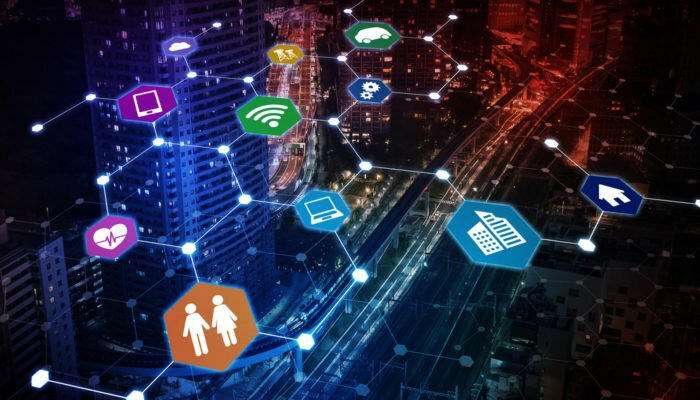 Along with this, we will witness IoT devices in smart cities becoming more complicated – from sensors and ordinary robots like ATMs and coffee machines to mobile robots such as lawnmowers, delivery drones, and utility vehicles,” claims Alisher Khassanov, the industrial engineer behind Robonomics Network, an Ethereum network infrastructure for autonomous robots’ integration into manufacturing and supply chains. Breathtaking upgrades and features for the bull market await users of decentralized exchanges with their growing recognition and UX improvement. Potentially huge benefits associated with DEXs, such as holding customers’ funds outside of exchanges and free entrance for anyone; decentralized exchanges are expected to pick up more volume. Along with that, “DEXs’ incapability of fiat-to-altcoin pairing will boost the advancement of Layer 3 interoperability protocols operating on the P2P network model. Such a technology is not based on a common ledger and simplifies fiat money payments and exchanging different assets, be it cryptocurrency, fiat money or equivalents of kilowatt-hours,” says Max Demyan, CEO at the GEO Protocol project that allows building different third-party dApps and solutions, including cross-chain decentralized exchanges. According to Demyan, It seems inevitable that peer-to-peer, censorship-resistant decentralized exchanges will continue to rise in popularity throughout 2019. If DEXs can come up with solutions that balance regulation standards and privacy as well as functionality and intuitiveness, they can eventually beat CEXs. A downturn for ICOs this year has already reduced the number of projects hunting for media attention. More thorough product filtering is now reducing the demand for media coverage, meaning decent projects are in a better position to reach their target audience. Media which is overusing paid content will either return to journalistic standards to save traffic or be forced to make way for someone else. “Mediocre projects that try to close the eyes of editors with money are becoming aware of the meaninglessness of doing so because of the prospect of ending up with empty pockets and no positive outcome,” supposes Diana King, CEO of LEVER8 PR agency, focused on blockchain projects. She is positive that prices for ad placement are likely to decline and editorial boards will be forced to reduce staff to pre-hype levels. “Those who initially kept the bar high and were not involved in scandals caused by the publication of commercial materials without the “sponsored” mark will survive,” Diana adds. In 2019 more companies will allocate additional funds to the blockchain, and those who are already engaged in this will move one step further towards ready-to-use products. Because of the new legislative reality, those who had previously planned to hold an ICO will set sights on holding an STO, which on the one hand will complicate their task, but at the same time will force them to ponder upon their tokenomics more thoroughly. Decentralization, interoperability and going beyond one blockchain will manifest itself in the emergence of new protocols and the advancement of existing ones.